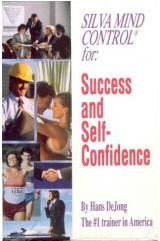 I’m now listening to the audio book, “Silva Mind Control for Success and Self-Confidence” by Hans DeJong. Wow, great stuff. He presents a method to control the mind, a method originally created by Jose Silva. Hans goes into detail about the Silva program and how to use both sides of the brain. The audio also contains mind relaxation audio for the mind. Taking that into consideration, he mentions that one should try to capture this good feeling of confidence that comes from the previous successful experiences – capture this feeling and save it for future use. By that, he says to write down previous successes on a piece of paper going in chronological order starting from today. Also, write down how you felt. 1. Write list of previous successes. Look at it before you go to a meeting or some important undertaking, in order to refresh yourself with the previous feelings of confidence. 2. To achieve a goal, write down goal on index card and place somewhere to look at daily. Stick to your goal and be willing to do anything for it. Place it somewhere you look at it daily. Carry the index card if you can to look at it. 3. Write down all steps required to get there (2), and do them. Do not compromise it. If the step is too large, break it down (4). 4. Break down complex tasks into smaller units. 5. Put out all negative thinking only think positive. Can’t wait to finish this one. Good stuff.